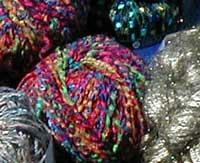 toys are good food: Yarn Bounty! Oh - what a great and wondrous plentitude waited for me when I got home! It's like I was showered in Berroco goodness and riches. Can you see some fun/funky scarves in my future? I know I can. Wow! The mother lode!!! Enjoy the funky fun!